BRIAN WILLIAMS, anchor: Finally tonight, you can't quite say it's this year's " Harry Potter " because the subject matter is very different, but it is the book of the moment and could soon become the Hollywood blockbuster everybody's talking about. Entertainment Weekly magazine calls " The Girl with the Dragon Tattoo " the hottest book on the planet right now. But the author has died since writing the book series , and, without clues from him, fans are left to go find them on their own, where they were written, in Sweden . Among those fans, our own Stephanie Gosk . 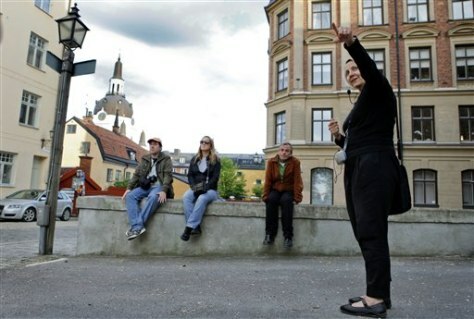 STEPHANIE GOSK reporting: Sweden has no problem attracting tourists. Beautiful islands, beautiful people, ABBA literally playing in the streets. But this summer tourists are flocking here for something else, Millennium series madness. "Dragon Tattoo" book tours in Stockholm are sold out. Unidentified Man: First page, second page, and it just quick, quick, quick, quick. GOSK: Swedish author Stieg Larsson 's dark and violent crime series has turned into a phenomenon. Forty million copies of the books have been printed worldwide. Last week in the US, one was sold nearly every second. The Swedish movies based on the series vaulted an unknown actress to fame, and now it's Hollywood 's turn. Daniel Craig will play muckraking journalist Mikael Blomkvist ; Lisbeth Salander , the dragon-tattooed, computer hacking vigilante, has get to be cast. Mr. MIKE FLEMING (Deadline.com): It is the biggest star-making opportunity for a young actress in perhaps as long as I can remember. GOSK: For fans like Linda Harding from California , Salander is the series. Ms. LINDA HARDING: She's strong, she's smart. And yet, if you -- if you looked at her, you wouldn't, of course, think that. GOSK: Adding to the intrigue of the novels is the author himself. In 2004 , he died suddenly, just before the books were published. When Larsson died, he was making just $30,000 a year. He'd always dreamt of buying an cottage on an island . If he were alive today, he'd probably just buy the island . The crime writer drew inspiration from his own world, from the bucolic Swedish countryside to Stockholm . Like most Swedes , his characters drink a ton of coffee, sometimes at the same shop the author did. And in that neighborhood we discovered almost everyone has a tattoo. Anna has five. ANNA: That was actually quite painful. GOSK: Plot lines were ripped straight from the author's day job at a left-wing, pro-democracy magazine. Mikael Eckman worked with him for 10 years. Mr. MIKAEL ECKMAN (Expo Magazine Reporter): If you read the book, it's not hard to understand that he is a believer in democracy and feminism. GOSK: It's a political message wrapped within three thrilling page turners. And if rumors in Sweden are true, there could be more. Larsson may have written a fourth. Stephanie Gosk, NBC News, Stockholm . Fans of the late crime novelist Stieg Larsson are getting lost in the Swedish countryside, searching for the quaint town of Hedestad featured in "The Girl with the Dragon Tattoo."